I switch "Use AJAX when possible" Yes to No and it now works fine. Thanks for you help. Has the option to hide the empty cart if there is no product? I noticed that in this post was said it would be added on the next version and that was a couple of years ago. So it might have happened already but I cant figure out. Then, Joomla should not display the module if its content is empty. Old post but I m curious! Have you managed to hide the cart if the cart is empty? I did erase translation from language file and in the module but the module is there. Only the text I erased is missing. What I m missing here? 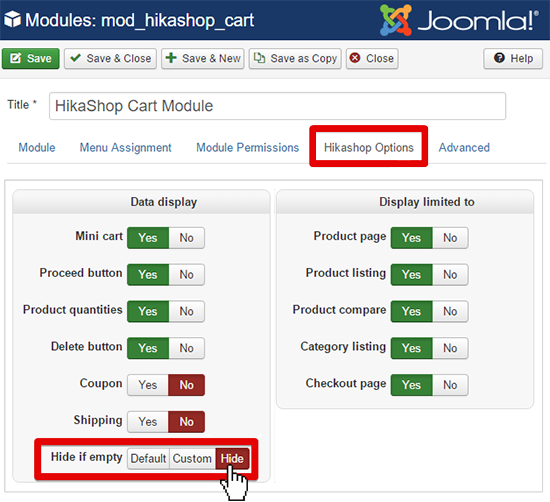 - Use the input search to find required module with "Cart"
- Click on "HikaShop Cart Module" to edit it. Last edit: 2 years 5 months ago by Philip. It still shows module, even if its empty. Thanks nicolas, yes you are right. Just for others using Yootheme templates: Go to Joomla backend >> Extensions >> Templates >> Open your template (edit) >> Options >> Modules find your module and set Style to Blank.